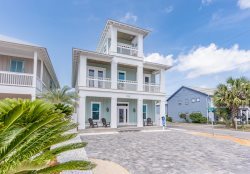 "Sweet N' Salty" is a beautiful beachfront vacation home located on the West End of Panama City Beach. This home is just steps away from the most beautiful beaches in the world! With spectacular views of the Gulf of Mexico, this 3,139 square feet beachfront house will sleep up to 22 guests. Conveniently located on the tranquil West End, yet within only 2 miles of the bustling Pier Park, "Sweet N' Salty" has every luxury desired for a beach vacation. Click on the virtual tour button above to see what this home is all about. Sweet N' Salty provides guests with a dream beach vacation. Every detail is strategically designed to provide guests with a lavish and memorable stay. The private elevated heated* pool is 23 feet above the sugary white sands to provide breathtaking unobstructed views of the Gulf of Mexico, while soaking up the Florida sun. The pool deck provides plenty of space while enjoy an amazing sunset. The open floor plan adds to the beauty and space of this property, this allows families to interact while being in either the kitchen, dining, or living room. And if additional separate entertainment space is needed Sweet N' Salty has that covered also, there is a media room with a flat screen located on the 3rd floor. This perfect vacation property will also have a flat screen in all 6 bedrooms, and of course cable and Wi-Fi provided. The first floor of the home has a 1/2 bath along with a 2nd refrigerator providing plenty of room to store the groceries needed for your stay in paradise. The second floor is equipped with a full stocked kitchen and a large dining area. The living room is filled with comfortable seating, including a queen-sized sleeper sofa, a flat screen TV, a half bath down the hall, and a sliding glass door that leads to the furnished pool deck and lounge area. Also, on this floor is two king size bedrooms with en-suites. The third floor in Sweet N’ Salty contains two bedrooms with queen over king sized bunk beds and flat screen TV’s. There is also a half bath and common area with a queen sleeper and flat screen TV. The house is then complete with two king master suites with a shared furnished balcony, perfect for watching sunrise and sunset. Guests will enjoy the clean modern décor at Sweet N' Salty, featuring new stainless steel appliances, lush bedding throughout, a fully stocked kitchen, and bath towels are all provided. Enjoy your beach getaway at a brand new, modern vacation property that was solely constructed with its guests comfort in mind. What are you waiting for? Plan your dream vacation at Sweet N' Salty TODAY!!!! Brought my family here for vacation and could not have picked a better place. Holiday Beach Rentals made everything easy for us. The beach house was brand new, and beyond our expectations. Definitely had an amazing trip! Our family of 17 - 9 adults and 8 kids (7 years - 9 months) had plenty of room and space to breathe in this gorgeous beachfront home. Bedrooms were spacious and most had their own bathroom stocked with towels. A total of 6 king beds, two have a queen bunk over them - extra high with plenty of space underneath. The ceilings were vaulted and/or extra high as well as the doors making everything feel airy and light. Beautiful decor on the walls to make the home inviting and tv's (all bedrooms plus two in common areas up and down) were all wall mounted to keep little hands from touching them. Three pull out sofas provide extra space to spread out if needed. Kitchen was well stocked with everything we needed and more. Grill tools we didn't find until the end of our trip - they were in the beach level kitchenette near the outdoor grill but will be useful next time! The best feature though was the proximity to the beach and the ease of walking to and from the beach. Excellent Experience here!